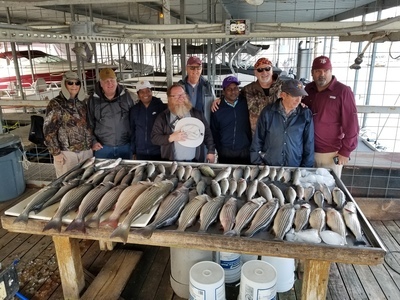 Lake Texoma striper fishing has really come alive this week with the arrival of spring. 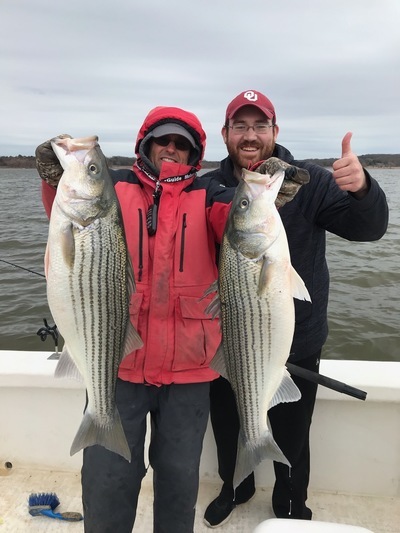 Big striper are on a feed frenzy getting ready to make their annual spring spawning run up the Washita and Red rivers. As the shallow waters warm fish move up out of the river channel to feed on shad. The fish are on the move so anglers need to be persistent and stay on the move looking for active fish. My bait of choice for early spring is a 5″ swim bait on a 1oz jig head. Trolling is also effective this time of year and on days when my customers can’t cast well we troll. The last few days the big striper have been on a tear and we have been releasing many over 20″ fish on recent trips.